This Chocolate Peanut Butter Smoothie Bowl is jam-packed with nutrients, protein, and fuel to keep you going all day long. It contains just a few simple ingredients and is full of chocolate and creamy peanut butter. You’ll never guess that this bowl is secretly healthy! Well, guys, I finally did it. I jumped on board the smoothie bowl train and I’m not getting off anytime soon. If you’ve tried this healthy drink in a bowl, then you know what I’m talking about. And if not, let me explain. I know you’re probably thinking “What’s the big deal? It’s just a smoothie in a bowl.” Am I right? Well, yes, it is a smoothie in a bowl, but guys, it’s SO fun to eat with a spoon! I love the consistency of my smoothies to be thick and creamy. You know, where you practically have to use a spoon and slurp through your straw as hard as you can to drink it. So, naturally, smoothie bowls are the better option. You can actually eat it with a spoon, no straw required. And I don’t look like a weirdo digging my spoon into the bottom of my smoothie glass. And I’m happy to report that my smoothie bowl obsession all started with this Chocolate Peanut Butter Smoothie Bowl. After I tried Almond Breeze Almondmilk Chocolate, I was in love. It’s creamy, chocolatey, and nutritious. Almond Breeze is my product of choice, so once I tried their chocolate milk, I was in love. I knew I had to use this milk in some kind of recipe, so I decided that I would become a smoothie bowl convert. And luckily, my smoothie bowl addiction is just getting started. This Chocolate Peanut Butter Smoothie Bowl is jam-packed with nutrients, protein, and fuel to keep you going all day long. It contains just a few simple ingredients and is full of chocolate and creamy peanut butter. You’ll never guess that this bowl is secretly healthy! This Chocolate Peanut Butter Smoothie Bowl is loaded with ingredients that you can feel good about. And because you can customize the toppings, this treat is a winner for everyone. I added bananas, kiwi, strawberries, and granola to make this smoothie bowl a nutritious and delicious breakfast. It’s ready in just minutes and is the perfect dish to rekindle your love of smoothies. So trust me, guys, if you haven’t jumped on the smoothie bowl train yet, go for it! This Chocolate Peanut Butter Smoothie Bowl is creamy, full of flavor, and the best treat to eat with a spoon. So what are you waiting for? Grab that Almond Breeze Almondmilk Chocolate and whip up this easy treat today! This Chocolate Peanut Butter Smoothie Bowl is jam-packed with nutrients, protein, and fuel to keep you going all day long. It contains just a few simple ingredients and is full of chocolate and creamy peanut butter. You'll never guess that this bowl is secretly healthy! In the canister of a blender, combine the Almond Breeze Almondmilk Chocolate, peanut butter, banana, yogurt, and ice. Pour into a bowl and top with granola, banana, strawberries, kiwi, or any of your favorite fruits. Putting a smoothie in a bowl is so much smarter! I love it. Eating with a spoon is just more fun! And it's PB, so of course, I'm all over it! 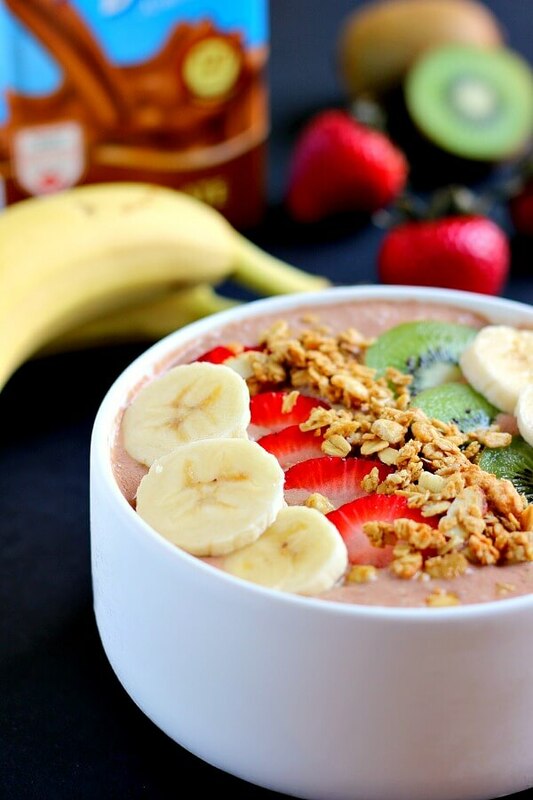 I would love to start my morning with this smoothie bowl! It looks perfect, Gayle! Love all the toppings you added and the peanut butter and chocolate almond milk is such a great idea! So healthy and delicious! Thanks, Kelly! You definitely can't go wrong with peanut butter and chocolate! This looks like a great way to start the day! Love all those toppings! Thank you, Kelly! This makes the perfect breakfast! Oh my goodness, Gayle! These smoothie bowls are just beyond STUNNING! You packed literally all my favorite breakfast things into one gorgeous bowl and I am obsessed. Gotta try these asap! Thanks, Sarah! Hope you like this bowl if you try it! haha, I'll be joining you on that smoothie bowl train soon!!! I love this smoothie bowl, Gayle!!!! looks delicious! Hop onboard, Alice! :) Thanks for the smoothie love! I have yet to try a smoothie bowl, but I do like my smoothies nice and thick so I guess it makes sense! I make a similar peanut butter and banana smoothie all the time, and now I've got to try it with chocolate almond milk. This looks like the perfect breakfast to power me through my day! Thanks, Kristine! This was my first smoothie bowl, so I'd have to say that I'm hooked! It's so fun to eat it with a spoon, too! This is exactly how I like to start my day! Love this smoothie bowl, Gayle. The colorful fruit on top of a chocolate peanut butter smoothie has me so hungry right now!! Thanks, Jen! It's sweet and healthy, definitely a great way to start the day! Thanks, Blair! I can't get enough of the Almondmilk Chocolate...so good! I think you would love this, Sam! Thanks for the smoothie love! Aren't smoothie bowls the best! They feel like much more of a meal when they are in a bowl, and it's all about the toppings. I definitely agree! Thanks, Dannii! 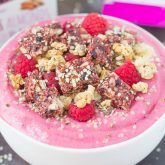 I've never actually had a smoothie bowl and this one makes me want to try it! I love peanut butter in just about anything and the addition of the banana sounds perfect! Thanks, Rachelle! This definitely hits the spot! I'm so happy I have everything I need to make this! I know what I'm having for lunch today! Hope you like this if you try it, Annie! Love smoothie bowls and this one looks perfect! Pinned! Smoothie Bowls are one of my favorite breakfast dishes. Love this recipe! Thanks for the kind words and for stopping by, Lauren! Pass me two bowls and two spoons, I am not even kidding, I would gobble this stuff, it sounds amazing! Thanks, Cyndi! Hope you like this if you try it! 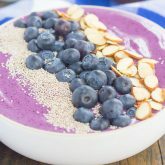 I have never tried smoothie in a bowl but it sounds so fantastic! I have to try this! Thank you, Manali! It's so delicious! Yes, I love chocolate and PB. This looks so good Gayle! Thanks, Harriet! The chocolate and peanut butter make the best combo! Gayle - YES! I definitely need to try smoothie bowls. I've seen them on the web before, but haven't sat down to whip one up. Now, I'm totally making one because pb and chocolate is my weakness. Thanks, Erin! Peanut butter and chocolate gets me every time, too! I'm going to have to jump on the smoothie bowl train! This looks so good! So, I still haven't gotten on the smooth bowl train, but I have recently started drinking smoothies for breakfast everyday, so it is only a matter of time! Smoothie bowls always look so much prettier than regular smoothies and I love all the extra fruit that you added! Thanks, Izzy! I love adding the fruit on top of these bowls. It's so easy to customize and tastes SO good! I'm the type of girl that has to chew her food. I love smoothies, but I don't feel full if I'm not chewing something. This is the answer! Looks incredible! Thanks, Ali! 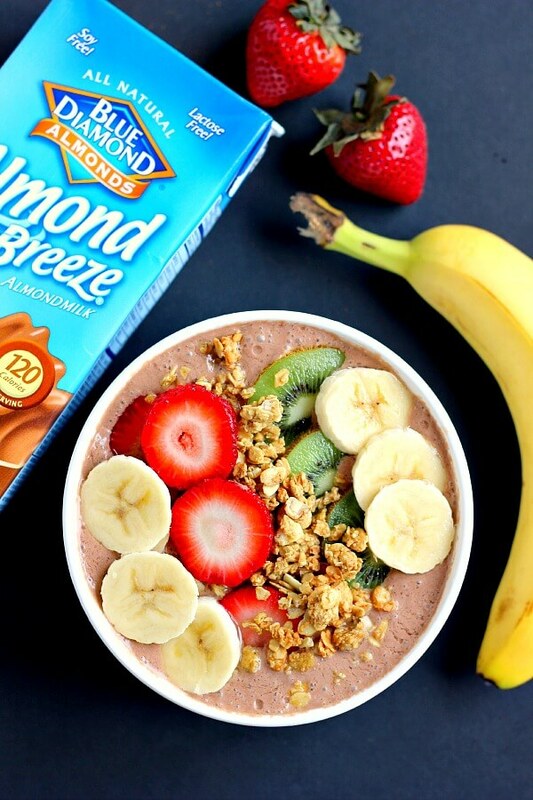 Sounds like this smoothie bowl is perfect for you! This looks fantastic Gayle! I love smoothie bowls especially when they involve chocolate! I am obsessing over smoothie bowls lately. Smoothies are my go to every morning. This is one gorgeous addition I wouldn't mind starting my day with. Thank you, Kathy! I love smoothies too, such a great start to the day! 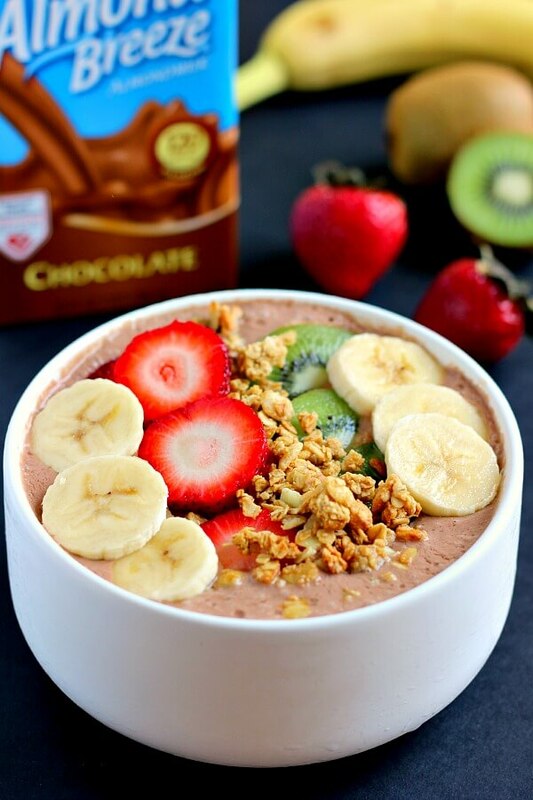 Ok, you had me at "peanut butter", but then I kept on reading the title, and then you had me at "chocolate" But, now, you have me at "smoothie bowl" ;) Mmm! This looks SOOO delicious! Haha thanks, Kennedy! It's a delicious combo! 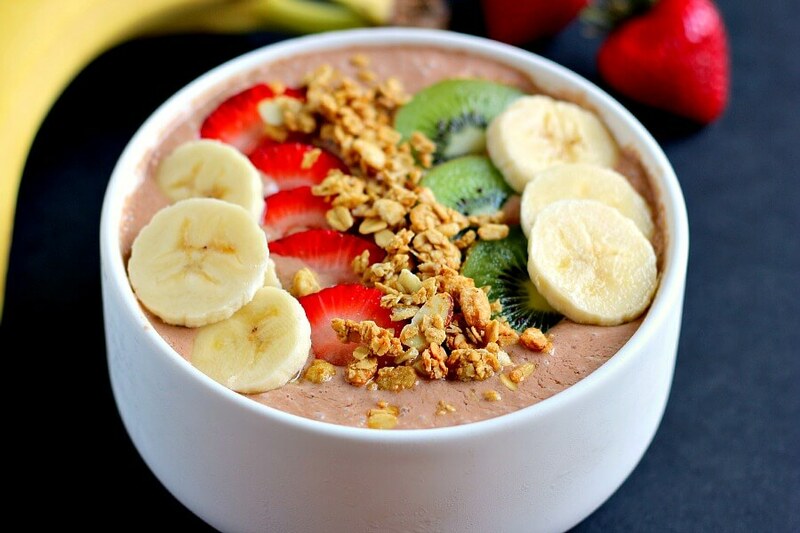 This smoothie bowl looks amazing! I love all the mix-ins you added on top! LOVING this smoothie bowl, Gayle!!!! Chocolate + PB has to be the best flavor combo ever :) This is the kind of filling breakfast I love waking up to! Pinning and hope you are having a great week! This is a great way to re-invent the typical fruit based smoothie bowl! We recently became obsessed with walnut butter by Artisana - do you think that would work as well? I love smoothie bowls because they're so versatile, Felicia! I definitely that that walnut butter would be a great substitute. Please let me know how it turns out and thanks for stopping by! I never think to make smoothie bowls in the mornings! I'm always rushing but I really need to plan better - this looks so so good with the chocolate peanut butter combo! Thanks, Ashley! Peanut butter and chocolate make everything better! So clearly I've been missing out. I saw all the other smoothie bowls in the universe and was like, "whatever." But CHOCOLATE peanut butter?! I can get into this! I <3 almond breeze! They make lactose intolerance so doable. :) Man this smoothie bowl is gorgeous! All those fresh fruits look so good and let's be real, chocolate for breakfast is always a good choice. I need to get on this smoothie bowl train, it looks like the way to beat summer heat! 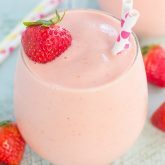 Thick and creamy smoothies are the way to go!! These look so good Gayle! Peanut butter and chocolate is the perfect combo for these bowls! Pinned! Thanks, Mariah! Peanut butter and chocolate definitely make the perfect pair! 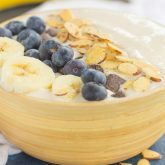 Gayle, this smoothie bowl look very delicious! I love the combo of chocolate and peanut in here! yumm! Nice simple smoothie bowl recipe. Just pinned it. Hope you love it, Anna!